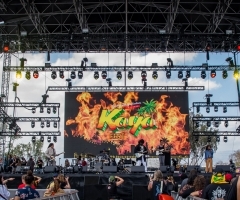 The 2nd Annual Kaya Festival may be right around the corner this April 28th and 29th, but the celebration of everthing herbal officially started as of March 24th with the Kaya Fest Preparty, hosted by Nug Radio and Vice TV's Ras Mike at Garden Grove's Garden Amphitheatre. With the sun high in the sky on a slightly chilly Saturday afternoon, the Garden Amp gates opened to welcome the Kaya pre-partiers with open arms – and a free bottle of kombucha, to boot! What hospitality. Inner Waves kicked off the Kaya pre-fest, followed by high-energy skanking band Special Blend. Latin-fusion band Simbala was up next, who welcomed fellow Roots of Mine players onstage to guest perform. And, what would a Kaya preparty be without a Marley in attendance? That's right, Daniel Bambaata Marley and his crew took the stage as direct support to everyone's favorite SoCal reggae-rock bad boys, Tomorrows Bad Seeds. 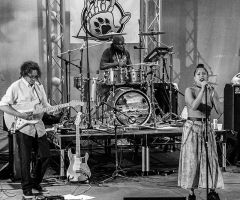 Between the genres that each band brought to the table, this small sample illuminated all that Kaya Fest 2018 is going to offer: roots reggae, hip hop, Latin, ska, a dash of punk, a touch of pop and good ol' rock and roll. A great time was had by all and meeting Weed Jesus wasn't all that bad either. 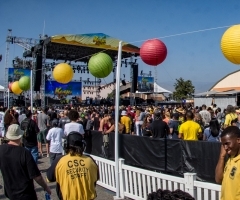 To secure your tickets for the upcoming Kaya Festival in San Bernardino, California, visit www.kayafestivals.com.